WASHINGTON – Immigration and Customs Enforcement could have saved up to $41.1 million on flights carrying immigrants across the U.S. and back to their home countries simply by filling up more seats on those planes, a recent audit says. 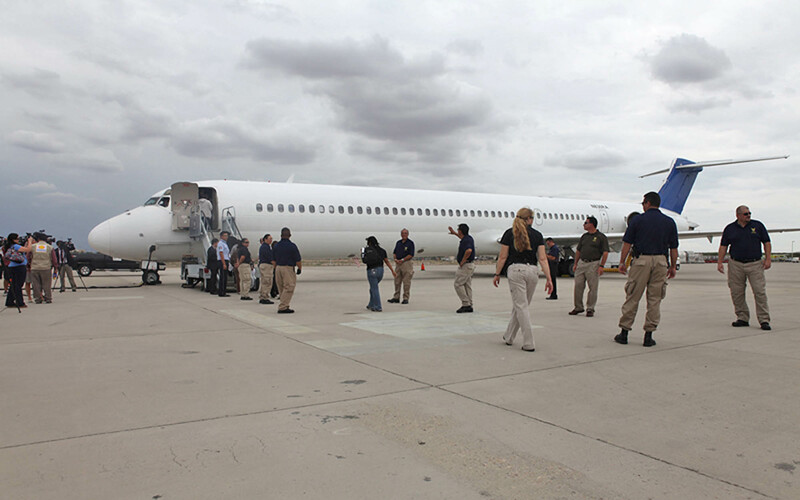 The report by the Department of Homeland Security’s Office of Inspector General said that Mesa-based ICE Air “met its mission” by transporting 930,435 detainees over a 3.5-year period beginning in 2010, but that it could have done so more efficiently. In its response to the audit, ICE concurred in most of the issues raised, which it blamed on staffing and training shortages. But it took issue with the suggestion that empty airplane seats were necessarily wasteful, saying that it it sometimes more efficient to send a plane with empty seats than to wait to fill it up. The April 9 inspector general’s report said ICE Air spent around $116 million on flights that were less than 80 percent full. Flights that were not at capacity included both domestic and international flights. One problem, the report said, was the fact the ICE has not determined an optimum capacity for each type of flight. It also cited problems with recordkeeping, noting that ICE’s office of Enforcement and Removal Operations does not collect data about frequency, causes, or solutions related to redundant transfers. At an average cost of $8,419 an hour per charter flight, ICE Air could have realized cost savings of up to $41.1 million if it could determine an optimum flight capacity and stick to it, the report said. 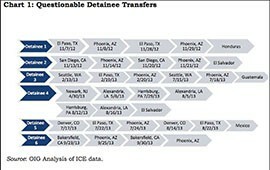 The audit also criticized ICE’s Alien Repatriation Tracking System. Its analysis of 7,445 missions found 23,597 detainees who were listed as dropped off or picked up at locations that were not on charter flight routes, for example. Gender, criminal status, or gang affiliation were not always accounted for in the tracking system and identification numbers for fingerprints belonging to 190,243 transported detainees were not included. Rep. Paul Gosar, R-Prescott, called the inspector general’s report a “good starting point” for improved operations at the agency. “The OIG report on Enforcement and Removal Operations clearly highlights some serious flaws in basic oversight and management practices,” Gosar said in a prepared statement Friday. The audit made four major recommendations: Provide formal policies and procedures for ICE Air; assess and provide necessary training; implement a data management plan; and conduct a comprehensive assessment of the Transportation and Removal Program. The audit said ICE concurred with all four recommendations and had begun taking actions to implement them. 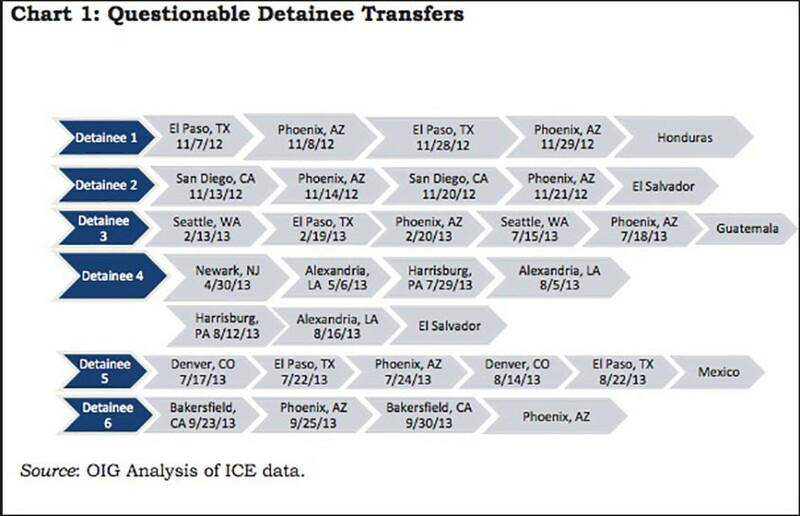 One problem cited in the audit of ICE Air operations was repeated shuttling of deportees back and forth between U.S. cities, as noted in six cases in the graphic above. 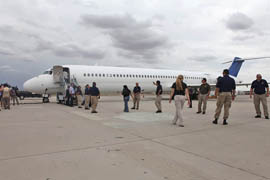 Immigration and Customs Enforcement officials board a plane in Tucson that is headed for Mexico City under the agency’s immigrant repatriation flights program in this 2011 file photo.